Occupation: Embodiments of their respective multiverses. Their pawns used in their competition (Aquaman, Batman, Captain America, Catwoman, Elektra, Flash, Green Lantern, Hulk, Jubilee, Lobo, Namor, Quicksilver, Robin, Shazam, Silver Surfer, Spider-Man, Storm, Superman, Thor, Wolverine and Wonder Woman). Powers/Abilities: Considering that the Brothers are the sum total of everything in the Marvel universe (and the rest of its multiverse-- see comments) and DC universe, they are incalculably powerful, and even such cosmic entities such as Eternity are like insects to them. The Living Tribunal, the most powerful being known in the Marvel Universe, was barely able to stall them, and was beneath their notice. History: (DC vs. Marvel#2(fb)) - In the beginning, there were two genderless entities, the Brothers. They were the Yin and Yang, Good and Evil, the Mainyu. Each entity encompassed the whole of everything, except each other. Once before they came together in battle, unleashing forces that ended and then began creation all over again. In the explosion of death and rebirth, the entities were blasted apart -- their shattered essence fractured the new-born universe into a pair of "multiverses". One entity became the embodiment of the "Marvel Multiverse" while the other became the "DC Multiverse". Fragments of their essence blew in all directions, and as the multiverses spread outward, so did the entities. It took them eons just to remember they had consciousness, and after all that time their memory of each other had vanished. (DCvM#2(fb)) - Due to recent cosmos-shaking events that tore the fabric of the multiverses and redefined reality, the entities became aware of each other once more. Once again realizing that each was no longer "Me" but "Us", they could not exist with their lack of uniqueness. Nor was either one whole, for some of each of them wound up in each other's multiverse as a result of their battle millennia ago. But in observing and understanding the existence of their respective cosmic guardians, the Spectre of the DC Multiverse and the Living Tribunal of the Marvel Multiverse, the entities reached a solution. Based upon their beliefs that each of their respective multiverses is intrinsically superior to the other's, both entities desired to be "whole" and "unique". Realizing the futility of a head-to-head battle, the entities instead chose to pit their respective super-powered beings against each other in a war to end all wars and to end one multiverse. Whichever side lost the most battles would vanish forever. Also, if the super powered beings refused, the Brothers would go to war, and all would be destroyed. (DCvM#3)- Apparently, the Brothers decided to settle things their own way instead of waiting for the battles to finish (A trillion years is like an eye blink to these guys and they can't wait a few days?). 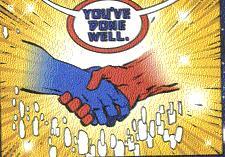 So they seemed to merge, creating a single universe out of the two, the Amalgam universe. (DCvM#4)- It is revealed that the Brothers did not merge. Instead, in a last ditch effort to prevent having a universe torn apart, the Living Tribunal and Spectre had created an Amalgam universe as a result of their holding the universes together with their immense power. The Brothers were upset over that. After Access restored both universes and separated the Amalgam Universe, The Brothers ended up fighting each other, with such power being released, that even the Living Tribunal was awed. They continued fighting, and began doing damage to both of their universes, which were still overlapping. The Living Tribunal and Spectre were trying to hold back the Brothers, but to no avail, for they were as nothing to the Brothers. Captain America and Batman, who were watching the battle with Access, went to try and do something. The Brothers ended up seeing both Batman and Captain America's pasts. They saw them from beginning to end, and then "The Brothers look at each other as if seeing each other for the first time. Eons pass as the Brothers come to the slow realization that they who encompass reality have become smaller than the smallest of their components (by acting like such savages). And a billion billion years hence, the Brothers, for the first time in recorded, or unrecorded history speak. And they say the same thing." They shake hands and tell each other that they have done well. A billion billion years rolled back upon themselves, and the universes are separated once more. Comments: Created by Ron Marz, Dan Jurgens, and Claudio Castellini. Marvel characters are listed in bold black type. Amalgam characters are listed in purple type. 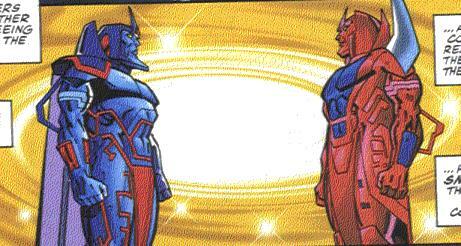 As seen in the DC vs Marvel limited series, the Brothers encompass their entire respective multiverses (i.e. The Marvel Brother encompasses both the mainstream Marvel universe and its alternate realities such as Earth-Days of Future past etc.) It extends beyond just their Multiverses, though, as realms such as the New Universe, outside of the mainstream Marvel Multiverse, were affected. 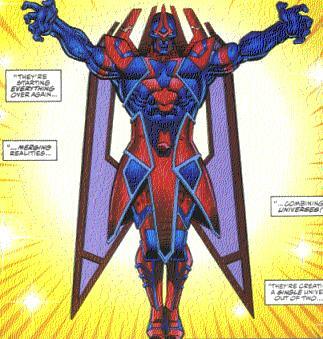 However, they do not encompass the entire Omniverse, only DC and Marvel Megaverses. The Omniverse is the term used to describe all realities and all multiverses, whereas Megaverse is a term (coined by Snood) which is used to describe all multiverses within one line of comics. All of it is within the Omniverse, whether or not it is in the comics. For an in depth explanation of the Omniverse and the other terms along those lines, click on the link below. In--of all places--The Adventures of the X-Men#12, the hierarchy of the Brothers (as higher than the Living Tribunal) is disputed. This is a somewhat interesting series, as I had initially just assumed it to be adaptations of the X-Men cartoon. I watched the first season or two, but didn't continue to follow it, so I can't confirm or deny this as being the case. 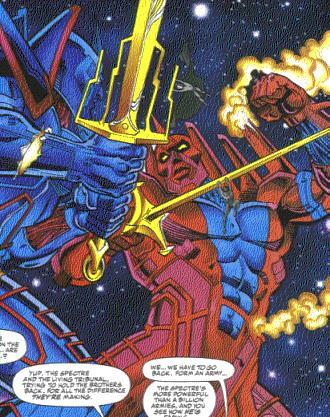 However/Anyway, in this issue, the demons D'Spayre and the Dweller-in-Darkness instigate the destruction of the M'Kraan Crystal, which in turn destroys all reality. Phoenix harnesses all of the positive emotions of everyone in the universe and uses this energy to have the sentience of the universe join with Galan of Taa and allow him to survive the destruction of the universe, and to ultimately become Galactus in that Universe. So, the implication is that the events of that series (and possibly of the cartoon) took place in the universe before the current one. At any rate, the relevance is here: During this conflict, the Living Tribunal is seen to be holding the Two Brothers in the palm of his hand, as he goes to consult with his "hooded, spectral ally" (clearly the Spectre). As the old universe is destroyed, the Tribunal releases the Brothers to "assume their pre-destined roles as architects of new realities." So, while the Adventures of the X-Men is not quite official canon, the book was written by Ralph Macchio, with the assistance of Mike Carlin, indicating that both Marvel and DC were involved in this explanation. The Brothers are thus intermediary in power and authority between the Living Tribunal and Eternity (or their comparable counterparts in the DC Megaverse). However, each Brother tends has some authority and control over universes outside the standard Multiverse, but within the Megaverse, while the Living Tribunal has not been shown to have authority over worlds outside the Multiverse. Quite frankly, I thought the entire thing with Marvel vs. DC could have been a lot better. The fights that people had always wondered about consisted of usually only a couple of frames. The Spectre in the DC universe isn't really the equivalent to the Living Tribunal. He is much less powerful and not the guardian of the multiverse. He is actually the embodiment of God's wrath or something. Also, when the Brothers supposedly merged, Marvel was winning. They had six winners (Thor, Electra, Silver Surfer, Spider-Man, Storm, and Wolverine), and DC only had 5 (Superman, Batman, Robin, Flash, and Aquaman). So the DC universe should have been destroyed. But it is a good thing that it wasn't, cause if there was no DC universe, whose behinds would Marvel be able to kick every month? No Matter how big you are, in the comic books, you will always be embodied by something. This story used that same plot device. The whole thing with the Brothers was very weird, but one part was quite touching, as in the picture to the left. Thanks to Skullogeist for letting me use the first two paragraphs detailing the Brother's history from his profile on the Amalgam Universe.